Trump’s fuel economy standard rollback will be a disaster for the United States, write Jeffrey Rissman and Robbie Orvis of California-based think tank Energy Innovation. It will harm American consumers and the transport sector and sharply drive up emissions. The only winners will be oil companies. The Trump Administration has frozen existing federal fuel economy standards for cars and SUVs at 2020 levels, undoing increases for model years 2022-2025 set by the Obama Administration with the ironically-named Safer and Affordable Fuel Efficient (SAFE) Vehicles rule. But clever acronyms can’t cover up the fact that Trump’s fuel economy standard rollback will be a disaster for the United States. 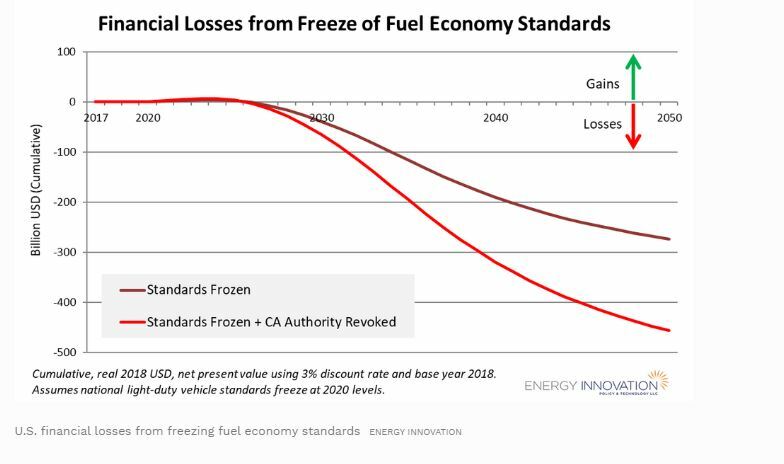 New modeling by Energy Innovation predicts that freezing these standards would cost the U.S. economy more than $450 billion through 2050. The Trump Administration has also revoked California’s right under the Clean Air Act to set its own vehicle emissions standards, which have been adopted by 13 states plus Washington, D.C., totaling 35% of the U.S. automobile market. California has vowed to fight this move in court, and if California prevails, the fuel economy freeze would only affect 65% of the market, lowering the costs of the proposal to $274 billion through 2050. Unfortunately, billions of dollars in new consumer costs isn’t the only negative impact of Trump throwing federal fuel economy standards in reverse: It would also increase U.S. transportation sector greenhouse gas emissions 11% and increase gasoline consumption 20%, both by 2035. To predict the impacts of freezing fuel economy standards, Energy Innovation utilized the Energy Policy Simulator (EPS). 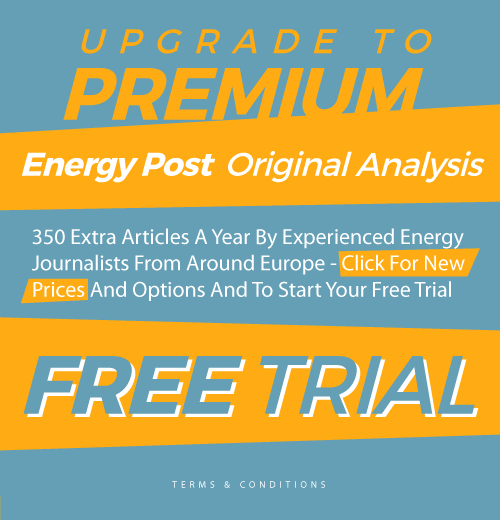 This open-source, peer-reviewed computer model uses non-partisan, public data from respected government sources such as the U.S. Energy Information Administration to predict the effects of policy changes on pollution, financial costs and savings, premature deaths, vehicle deployment and fleet turnover, and more. The EPS is freely available for public use. EPS modeling shows that in the first few years after freezing fuel economy standards, the rollback would create small financial gains because it is less expensive to build cheaper, less efficient cars. However, these gains are quickly outweighed by increased fuel expenses that grow each year, as more and more years of fuel savings are relinquished, reaching $457 billion by 2050 (in real 2018 U.S. dollars, discounted at 3% annually). 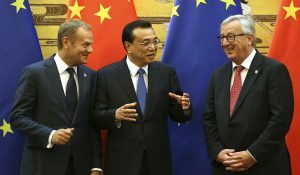 If this loss were represented as a tax on gasoline (the increase in amount spent on gasoline divided by the quantity of gasoline consumed), it would add 57 cents per gallon in the year of maximum impact (2040), and added costs would be more than 45 cents per gallon in every modeled year after 2033. Rolling back fuel economy standards would also increase transportation sector greenhouse gas emissions, worsening global warming. 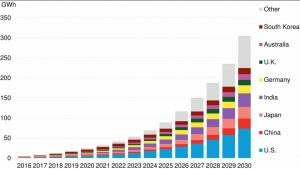 The greatest emissions increases occur in the 2030s, because the share of electric vehicles (EVs) on the roads is higher in the 2040s than it is in the 2030s, and EVs are not adversely affected by the freeze of fuel economy standards. 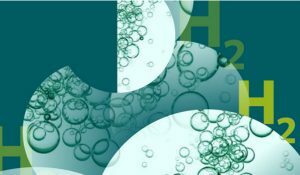 In 2035, under current policy, transportation sector emissions are projected to be 1,293 million metric tons (MMT) of carbon dioxide equivalent (CO2e). 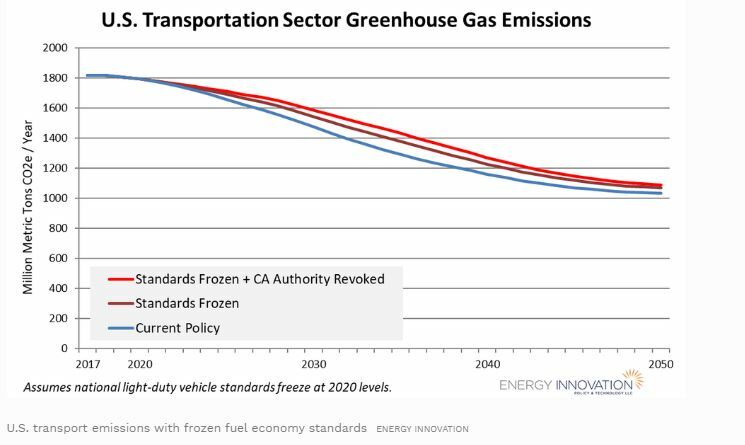 With the fuel economy standards frozen, that year’s emissions would total 1,432 MMT, an 11% increase . Without revoking California’s authority, 2035 emissions would total 1,378 MMT, an increase of 7%. Rolling back fuel economy standards increase fuel consumption. As in the case of greenhouse gas emissions, the greatest effects of Trump’s rollback come in the 2030s. 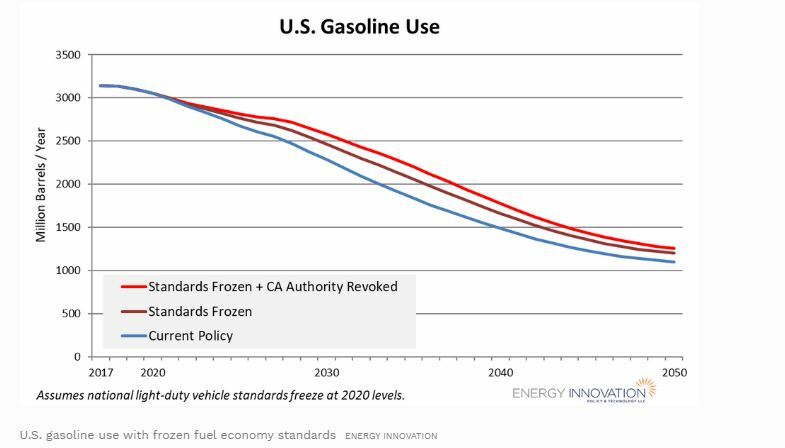 In 2035, with standards frozen, gasoline use would increase from 1,837 to 2,200 million barrels per year, a 20% increase. Without California, gasoline use would increase to 2,057 million barrels per year, a 12% increase. These percentages are higher than the percentage increases in transportation sector emissions because the transportation sector includes many vehicle types, such as trucks and aircraft, which are not affected by the proposed freeze in fuel economy standards. 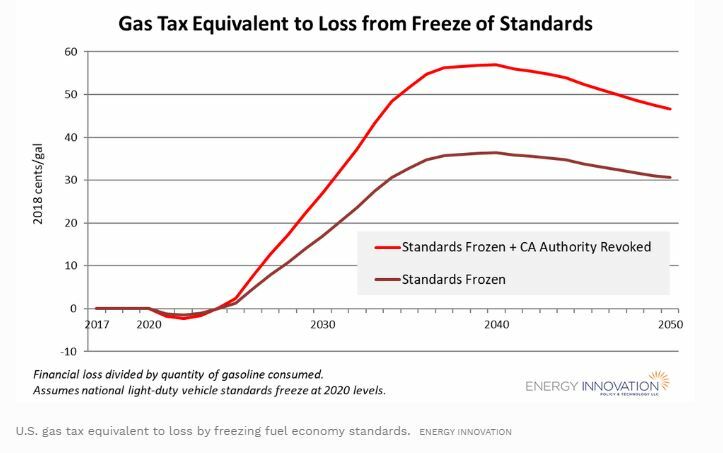 Cumulatively, from 2021-2050, the freeze would increase gasoline consumption by 6.9 billion barrels (4.3 billion without California). Freezing federal fuel economy standards will harm U.S. consumers, who will pay more money to drive their cars the same distance. It will harm businesses that rely on light-duty vehicles, such as taxi, food delivery, and ride-sharing services. It will worsen global warming and reduce U.S. energy security. 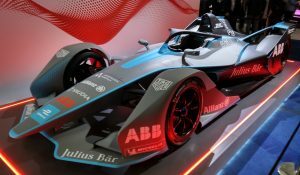 It may lead to a court battle with California and fragment the U.S. automobile market, increasing costs to automakers. It will reduce the competitiveness of the U.S. auto industry, which opposes freezing the standards. The only winners are the oil companies, who stand to sell more gasoline. 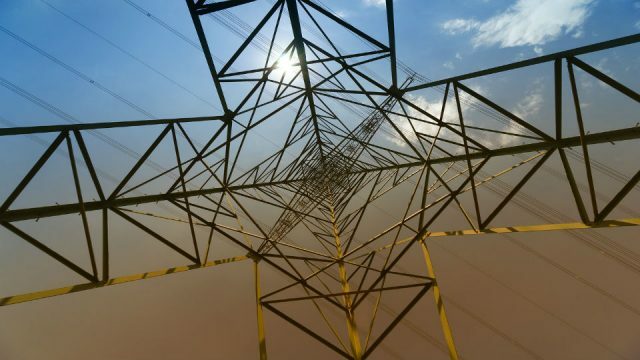 Energy Innovation is a clean energy and environmental policy think tank delivering high-quality research and original analysis to policymakers to help them make informed choices on energy policy. 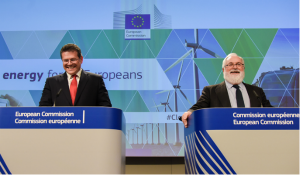 Its mission is to accelerate progress in clean energy by supporting the policies and uncovering the strategies to most effectively reduce greenhouse gas emissions. Article first published on Forbes.com, republished with permission.